Just doing some browsing like usual and came across an add for a XJ220 for ~$200 000. Price seems a little low to me... relatively speaking, but if I had it I'd love to have this thing collecting dust in my driveway. Here's the link. I`m sorry but that car is fugly. Not too good looking in pictures or in person. The "cat" shape doesn't work too well on this car and it is too long for what it is. Even if Jaguar had built these as originally planned with AWD and a V12 I still think the project wouldn't have done well in the end. The cars do have some neat points but over all I'd spend the 200k elsewhere. The cars do have some neat points but over all I'd spend the 200k elsewhere. So would I to be honest. But it *is* a bit of supercar history and even at nearly 20 years old I think it's still in the top 10 as far as max top speed goes. Sure but an F40 is older and better but more expensive by 100k or so. It is only money right? For ordinary folk the notion of which supercar is "better" is pretty much academic. From my perspective any and all of them are quite a thrill and you'd probably need a race track to determine which is better than the other in terms of raw performance data. All are very fast and have blinding acceleration. All corner like they're on rails. All are noisey, not particularly comfortable, and take some effort to drive. But, hey, that's what they're all about. Personally I really love the looks. It's no Testarossa or Diablo, but it certainly looks more elegant than they do and less aggressively angry than they do. 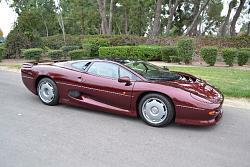 Unfortunately I've never seen an XJ220 in person like I have the other and maybe it doesn't look so great. Judging by the pictures, the only thing I can complain about is that it looks like a huge car. They are longer looking in person and look just a low as pictures make them look. I certainly agree that it is not "another Ferrari". I suppose for a Jag collector this car would be a top shelf item. I noticed that the ad states "It can now be licensed for use in Canada and in all states in the US aside from California." What a shame--I guess I will have to pass this up. Just buy a house in Nevada and store and register it there. old thread but the car looks to be BRG and the article states it was originally a teal car. If its a repaint deduct a MINIMUM 10% of the value (since this is a rare supercar id say 20%) of the car for non-original color. I loved the car up until I drove it. Not that a video game is an accurate way to base your opinion, but in the game they made the car very difficult to steer. It suffered badly from oversteer, I could only hope that the same couldn't be said if it were in real life. In comparison, the GT40 was a lot less challenging in turns and if I remember correctly, they were both mid-engine rear wheel drive cars. I guess it came down to the difference in horsepower in which the XJ220 significantly out gunned the Ford GT. For me, if money grew on trees, it would be a toss-up between a real Ford GT40 or an XJ220. It looks like the car is actually the teal. If you look at the parts of the car that are in the shade you can see the paint is metallic. The parts in the bright sun do look like BRG though. We just bought a collection full of very fresh low mile cars. These were all maintained, registered and driven to keep them in great running condition. I have posted a video of the Jag on youtube (CorvetteMikeCa's Channel - YouTube) also. Let me know if you have any questions about this fine Jag! I've got some leftover Maintenance items for sale.